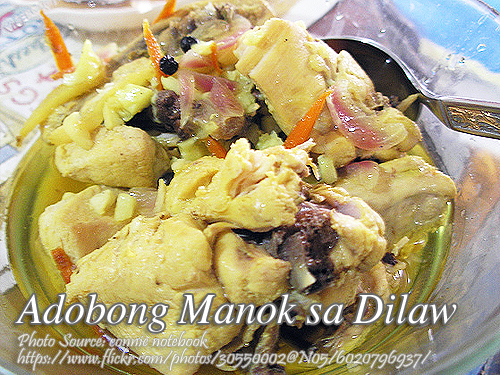 Adobong manok sa dilaw is chicken adobo with turmeric. This is not the usual adobo with soy sauce. What makes this dish yellow is the turmeric, commonly called “luyang dilaw” which is not only used in cooking but also has medicinal properties and used as folk or herbal medicine. To cook adobong manok na dilaw; In a pot or sauce pan put in the chicken, vinegar, and turmeric powder, simmer for 15 to 20 minutes or until tender. Put a little water if all the liquid evaporates. Remove the chicken from the pan and drain then reserved the liquid and set aside. In a heavy skillet or frying pan heat generous amount of cooking oil, fry the garlic and ginger until fragrant, remove from the frying pan and keep aside. On the same frying pan fry the chicken in batches until all side are seared. Return the fried chicken and garlic then put peppercorns and bay leaves to the sauce pan and continue to simmer until the remaining liquid has turned to oily sauce, correct saltiness as required. In a pot or sauce pan put in the chicken, vinegar, and turmeric powder, simmer for 15 to 20 minutes or until tender. Put a little water if all the liquid evaporates. Remove the chicken from the pan and drain then reserved the liquid and set aside. In a heavy skillet or frying pan heat generous amount of cooking oil, fry the garlic and ginger until fragrant, remove from the frying pan and keep aside. On the same frying pan fry the chicken in batches until all side are seared. Return the fried chicken and garlic then put peppercorns and bay leaves to the sauce pan and continue to simmer until the remaining liquid has turned to oily sauce, correct saltiness as required. Kahit na di sumakto sa picture yung niluto ko nasarapan naman yung mom ko for the first time! Thanks! That’s perfectly alright. And I’m glad na nakatulong itong recipe sa pagluluto mo.